Paralympic fever is upon us again as Rio 2016 looms upon the horizon - get in! I do so enjoy this four-yearly fix of spectacular disability sporting media coverage! Of course, back in the day (1983; when I sustained my spinal injury), there was no such thing as positive representation of disabled people in the media - I know, how crazy was that! Then, in the late 80’s, a muscle bound, lycra-clad, super hero of a Welshman, with his trade mark peroxide perm and dark glasses combo, burst into every UK living room that had a TV, winning the wheelchair category in the Great North Run half marathon and the London Marathon; smashing the course records both times! The media and general public adored this new trail blazer, Chris ‘Shades’ Hallam. It was Chris who inspired me to take up wheelchair racing and I competed in my first Great North Run half marathon in 1990 in a heavy national health manual dinosaur of a wheelchair – it took me a gruelling three hours and 40 minutes. Two years later, in a proper three wheeled racing wheelchair, I reduced that to one hour and four minutes, pretty good eh, but I was still being completely trashed by "Shades" and a clinically excellent young Welsh media darling called Tanni Grey. Does the name ring a bell? Tanni went on to be Great Britain’s most successful Paralympian ever with 11 Paralympic Gold medals and is now better known to us all as Baroness Tanni Grey Thompson. I would never match Chris or Tanni in a head to head (although I did beat Tanni crossing the road in Parliament Square one time! 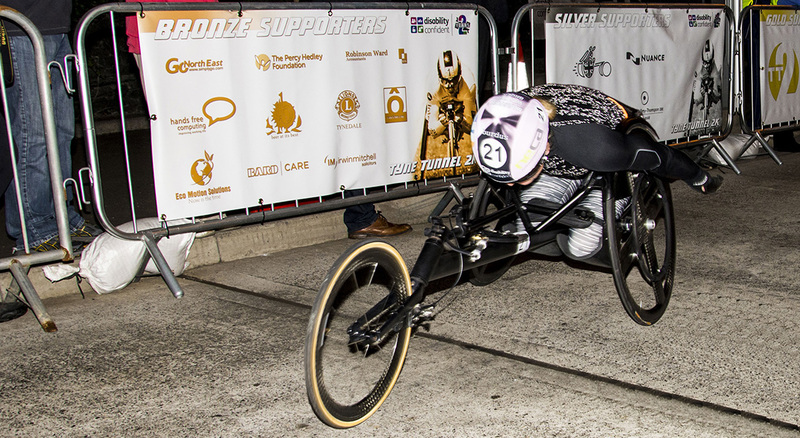 ), so I decided to get into the promotion of wheelchair racing instead and put my mind to the creation of an iconic wheelchair road race that would launch disabled athletes into the mainstream spotlight. My promoter’s ‘Eureka moment’ came whilst driving under the river Tyne on the A19 - how awesome would it be to rip a wheelchair down this 1km, 1 in 20 gradient, I thought. What an adrenaline rush! You could easily hit 40mph on the downhill with your backside one foot from the tarmac! On the downside, the uphill would involve a lung-busting, lactic acid burning 1km killer climb to get out again! I was of course driving through North East England’s Tyne Tunnel. To cut a short story even shorter, the Tyne Tunnels management loved my idea, and offered to close the road to traffic in the dead of night to form a temporary race course. Baroness Tanni Grey Thompson and her husband Dr Ian Thompson of the British Wheelchair Racing Association helped secure an elite athlete field and in 1993, the first annual Tyne Tunnel 2K International, the ‘fastest wheelchair race on the planet’, was born. The media response was truly amazing, including satellite TV coverage going out to 300 million viewers world-wide. The race is now well attended by world’s top international and British Paralympians. David Weir, 4 x Gold medallist at the London 2012 Paralympic Games says of Tyne Tunnel 2K, “you know you’ve raced hard when you can taste blood in your mouth!” Canadian Josh Cassidy says “the first time in the tunnel, you just wanna keep everything in your shorts!”. Baroness Tanni Grey-Thompsons says, “There is nothing like it anywhere else in the world!”. The race itself starts with athletes sprinting hell for leather to the tunnel entry portal. Then, as the downhill gradient steepens, athletes exceed 20mph. At this point, rear wheels are spinning so fast that manual propulsion becomes futile so elbows are tucked in tight, heads are drawn down to chair frames for the free-wheeling charge to the belly of the river. Heavier and more aerodynamic racers have the advantage here, clocking up 40 mph plus. Incidentally, the speed record for tunnel 1 is 47.6 mph - definitely not for the fainthearted. At this rapid rate and with a road deck 24 feet wide, it’s hardly surprising we limit athlete numbers to twenty four and drafting (slip streaming) is forbidden. If an athlete comes within 1m of another, they must either overtake or back off (by sitting up and using the torso as an air break) or suffer a life time event ban. On the downhill athletes ‘rest’, gulping down as much oxygen as they can. At the bottom of the descent, the road levels out momentarily and athletes re-engaging their piston-like arms, punching power down through the wheel rims to build up momentum for the daunting uphill section. Here, body weight becomes a disadvantage; lighter athletes (such as those with under developed lower limbs or amputees) start the fight back as they tend to be better hill climbers. The second leg of the race (forgive the pun), therefore, is just as exciting as the first. Question… are the heavier athletes far enough ahead to maintain their lead? Have they paced themselves properly on the uphill or will they burn out? Can the lighter athletes make up the ground? And after all this, when athletes get out of the tunnel exit portal and the finish line is in sight; have they saved enough oxygen and energy for that last energy draining sprint? It’s an incredibly tactical race and so hard to predict who is going to win until it’s all over. Although this media showcase is not open to the public, a handful of lucky event staff and corporate sponsors do get to watch the action from the 24 tunnel cameras on a big screen TV and at the finish line. Five minutes after the finish, footage from the two motorcycle cams is shown on the giant TV (during this time you can’t get any sense from the athletes who are all glued to the screen!). The Tyne Tunnel 2K International is now something of a cult status, a ‘must have notch’ on the belt of the world's elite racers. The 2km course record stands at an impressive three minutes forty seven seconds held by Australian Kurt Fernley. The top speed set in Tunnel 2 in 2012 by Canadian Josh Cassidy is a staggering 56 mph! My ambition For the Tyne Tunnel 2K International is that it continues and has a legacy effect on society, much like the Paralympic Games and that the event is seen as a sporting trail blazer, for inclusion, in its own right, just like the unforgettable and inspirational Chris ‘Shades’ Hallam and Baroness Tanni-Grey Thompson.